“The Economist’s” business travel blog, Gulliver, posted this video entry yesterday on fuel dumping. 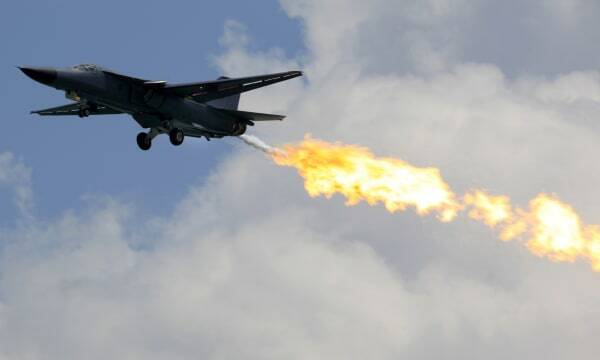 In this instance, fuel dumping isn’t what the F-111 pictured above is doing; it’s the practice of booking extra legs on a trip, which you don’t plan on taking, to trick airline-booking systems into offering you a much lower fare. Considering the number of fake travel stories we posted in celebration of April Fool’s Day on Monday, we can understand why you might be skeptical of the following post. But it has actually been confirmed by a number of news outlets across the globe, including the BBC. Still, considering the timing, I was double and triple checking the news. Samoa Air has announced that it will now start charging passengers based on weight. The controversial new pricing means that it will now be cheaper for thinner customers to travel with the tiny airline, which operates just two aircraft over a few relatively short routes. Those planes are small, which makes them more susceptible to heavy loads as they fly between Samoa, American Samoa, North Tonga, Niue, the North Cook Islands and French Polynesia. According to the new policy, passengers, along with their bags, will be weighed at the airport to determine just how much they’ll have to pay. They will then be charged a fixed rate per kilogram, which varies based on which route the passenger is actually flying. Those rates range from as little as $1 all the way up to $4.16 per kilogram. There are no extra bag fees of any kind, just a simple scale based directly on weight.Chris Langton, the Chief Executive of Samoa Air, has been widely quoted in the media as saying that this is “the fairest way of traveling,” and I’m sure many would agree. Sitting next to a particularly large passenger who takes up half of your seat isn’t especially comfortable and while this new pricing scheme won’t alleviate that issue, at least svelte customers will have the satisfaction of knowing that they paid less for their fare. Langton also says that the policy will help promote a greater awareness of health in Samoa, a country that is known for having one of the highest obesity rates on the planet. This is an interesting approach to pricing to say the least. As someone who tends to travel light, I personally wouldn’t mind seeing some of the bigger airlines adopt a similar approach. But considering the size of many passengers, not to mention their bags, I’m not sure how popular it would be with the general public. Besides, going through a TSA screening can be harrowing enough, how bad would you feel if you had to step on a scale at the ticket counter too?